Sister Gudelia has been blessed in her life in many ways but one in particular is key to her religious vocation. When she was a young child, her father told her that when she was born, her mother made the comment that she wished Victoria would not experience all the problems in life that her mother had. Her father replied that Victoria would become a sister. About 18 years later, her heavenly Father touched her heart in a mysterious way with the gift of a religious vocation and she became a Hospital Sister of St. Francis. Victoria Hennek was born in the small village of Oppeln, Silesia, Germany to devout Catholic parents. She was the third of eight children. She grew up in a happy, industrious household in this rural area of Germany. Because her mother had chronic health problems, Victoria found it necessary to seek employment at an early age. She began to work at St. Adelbert Hospital in Oppeln caring for the orphan children. This is where she met the Hospital Sisters of St. Francis. There were several young women who were postulants, and they all encouraged her to join them. She also observed the sisters at work and prayer and was impressed with their spirit of joy and dedication. She knew then that her heavenly Father was calling her to become a member of the Hospital Sisters. So, at age eighteen, she entered the Community and immediately applied to become a missionary to America. She traveled to the United States on a long ten-day trip across the Atlantic Ocean with three other postulants. She remembers being overwhelmed at the sight of the New York Harbor and the Statue of Liberty. She thought to herself, “What does the future hold for me in this new country?” At the harbor, two sisters met them. After an overnight stay in New York, they traveled to Springfield on the train. Soon after arriving at the Motherhouse, Victoria met her Aunt Sister Richarda, her mother’s sister. Later that year, Victoria received the religious habit and the name of Sister Gudelia. She began to learn more about the life of a Hospital Sister as well as the English language. On October 4, 1934, after two years as a novice, Sister Gudelia professed her religious vows. For many years, Sister worked at the Motherhouse in the laundry, the retreat house and other areas of the convent. She often worked with the postulants and novices and encouraged them to pursue their vocations and to dedicate themselves wholeheartedly to the work and spirit of the Community. After Vatican Council II, Sister Gudelia had the opportunity to expand her ministry to the hospital arena. She took the nurse aide course and worked with patients providing direct patient care at St. John’s Hospital in Springfield, Illinois. 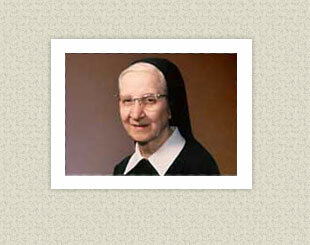 Later she served in Pastoral Care at St. John’s as well as at St. Vincent Hospital in Green Bay, Wisconsin. She still treasures the memories of being at the bedside of the patients where she brought the Lord to them in prayer and in consolation. Unfortunately, Sister began to lose her vision in her later life. However, it was a slow loss so she had the opportunity to adjust to her surroundings and to a more sedentary life style. Now that she is legally blind, Sister spends most of her time in prayer. She reflects on the many years that she has been a member of the Hospital Sisters and is grateful and happy that she has been able to serve the Lord for so long. Perhaps her wise Fathers, those providential ones, knew all along what a treasure she would be to the Hospital Sisters and to the many individuals whose lives Sister Gudelia would touch! Copyright ©2012-2019 Hospital Sisters | Site Developed and Designed by e-websmart.com.